Dr. Billy Taylor who has died aged 89, was a mentor and a friend. After listening to him on WLIB radio in New York for years, I met him in person just after I got out of high school in 1967. Although I was shy at the time, I mustered up enough courage to approach him...from then, he musically took me in. While I was still going to college, on break, I would visit him often on the set of The David Frost Show for which he served as Musical Director. Almost jokingly I told him that I'd love to write something for the band. He told me to come back in a couple of months. I came back and to my surprise, he asked me how soon could I do the arrangement. I wrote an original song called "The Third Wave." Once I delivered the chart, I had to go back up to SUNY-Fredonia. I would watch The David Frost Show religiously but never heard my tune. When I got back to NY and visited the set, Billy told me that there was a problem with the chart. Wel,l once the problem was fixed, Billy had the band play my song into every commercial break. It was an amazing experience to witness since I had no idea that the band was going to do that. 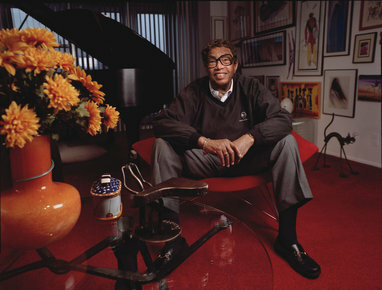 Billy Taylor was the one that encouraged me to join ASCAP which I still belong to today. I remember him telling me,"You can join BMI or ASCAP, but if you want a career as a composer, you'll join ASCAP." Jaijai Jackson of The Jazz Network Worldwide, a few days ago, put together a profile feature on me at her site. To my surprise, she found, among other photographs, a photo of Billy and myself. I cried when I saw it, thinking back on all he had done for me. It wasn't 48 hours later when I found out Billy had made his transition. Dr. Billy Taylor was a champion for the importance of the Legacy of Jazz, being the founder of Jazzmobile in New York in the 1960s. He was a champion for young people (I remember at a conference years ago, Billy showed me a rap that he had written for a youth symposium he was going to conduct). Through his music, he was also a social activist. His enduring composition, "I Wish I Knew How It Would Feel to be Free," became one of the anthems of the American Civil Rights Movement. Billy Taylor was someone you could always walk up to and say hello or engage in a conversation. Always with that youthful voice and big smile, you knew when you were with Dr. Billy Taylor, everything was alright. Abientot Billy. You now know how it feels to be free. Pianist/keyboardist/producer/arranger/songwriter Onaje Allan Gumbs (pronounced Oh-Nah-Jay) is one of the music industry's most respected and talented music collaborators. Gumbs has worked almost three decades with top talent in the musical fields of jazz, R&B/soul, and pop to hone his considerable skills. A partial list includes Woody Shaw, Nat Adderly, Norman Connors, Angela Bofill, Jean Carn, Cassandra Wilson, Marlena Shaw, Sadao Watanabe, Phyllis Hyman ("The Answer Is You" from his 1979 Somewhere in My Lifetime album), Stanley Jordan, Denise Williams, Vanessa Rubin, Jeffrey Osborne, Eddie Murphy, Rebbie Jackson, and Gerald Albright (Live at Birdland West). His most recent project is Just Like Yesterday.